In 2006, with the publishing of the volume Nulla due volte. 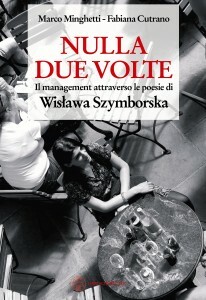 Il management attraverso la poesia di Wisława Szymborska (Nothing twice. The Management seen through the poetry by Wisława Szymborska), the research for innovative and interdisciplinary ways to interpret business made a great progress. The book is made up of a selection of twenty five poems by the Polish poet winner of the Nobel Prize, divided in 5 chapters. Each of it is devoted to a fundamental theme for the understanding of modern businesses: definition of individual and group identity; establishment of interpersonal relationships; selection of competencies necessary to achieve innovation, management of differences and talents; sense production process in organization, for which Karl Weick has coined the word sensemaking. Each poem is accompanied by a picture (by Fabiana Cutrano) and by a “sense path” signed by Marco Minghetti. Each of the 25 paths is enriched by contributions of people holding primary roles in rather different fields (politics, cinema, philosophy, music) in alternation with those by managers and businesspeople. Go to From: Nothing twice. The Management seen through the poetry by Wisława Szymborska. Selected Excerpts.